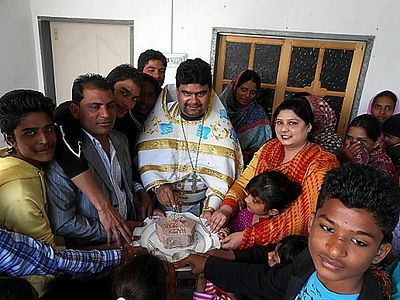 With the blessings of His Eminence Metropolitan Hilarion, First Hierarch of the Russian Orthodox Church Abroad, St. Michael the Archangel Orthodox Mission in Pakistan celebrated the 700th Anniversary of St. Sergius of Radonezh on August 18, 2014 at the St. Sergius Orthodox Church in Sargodha Pakistan with full zeal and zest. The solemn celebration opened with the procession followed by the festive Divine Liturgy. A prayer was made in the honor of St. Sergius of Radonezh, along with other prayers for the health of His Holiness Patriarch Kirill of Moscow and all Russia, His Eminence Metropolitan Hilarion, First Hierarch of the Russian Orthodox Church Abroad, for the Orthodox clergy and faithful, and for peace, unity, brotherhood and solidarity throughout the world. The faithful entered the place of worship holding banners and icons of Jesus, the Mother of God, and St. Sergius. 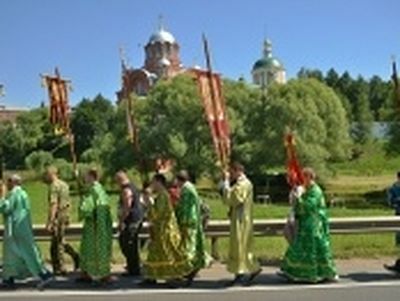 During the procession the faithful chanted Psalms and the song of the Holy Theotokos. The faithful with great reverence and joy laid flowers and lit the candles to the icon of St. Sergius. One of the banners displayed the national flags of Pakistan and Russia to mark the spiritual unity with the Mother Church. The other banner displayed prayer and intercession from the Blessed Holy Father St. Sergius, for peace and reconciliation in the world. On the other banner some words were printed to depict and honor the ascetic life of St. Sergius in the monastery. After the Divine Liturgy, Fr. Joseph shared thoroughly the life history and wonder works of St. Sergius. Fr. 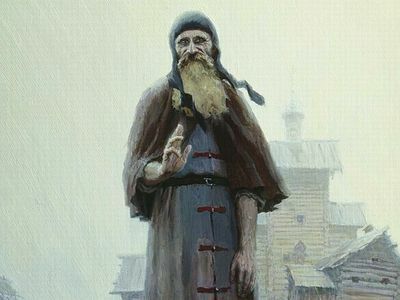 Joseph told the faithful that the ascetic life of St. Sergius teaches us hard labor, self-deprivation, humility, simplicity, obedience and patience in all circumstances, and when we face hard times and sufferings in our lives. He encouraged the faithful to read the Sacred Scriptures, in order to receive strength and blessings from God, citing the example of St. Sergius’s life. “Blessed father Sergius diligently read the Holy Scriptures to obtain knowledge of all virtue, in his secret meditations training his mind in a longing for eternal bliss.” He further shared that Prince Dimitry of Moscow received blessings from St. Sergius and obtained victory over the Tartars and success in the battle of Kulikovo, 1380. He added that St. Sergius was not only a saint of the Orthodox but of the whole world. Fr. Joseph shared that St. Sergius lived a life equal to that of angels. He was deemed worthy to converse with the bodiless powers while yet dwelling in the flesh. When the holy father served the Divine Liturgy, an angel of God concelebrated with him, according to the testimony of his disciples Isaac the Silent and Macarius, who were worthy men, perfect in virtue. Fr. Joseph concluded the solemn event saying that St. Sergius is not only the saint of Orthodox Church but of the whole world. Glory to God! Glory to Jesus Christ! We are blessed that we have the St. Sergius Orthodox Church in Pakistan. After the sermon, time was given to the Orthodox faithful to express their feelings and testimonies about how St. Sergius brings light and comfort to their lives and families. At the closing of the celebration all shared a festive meal, which was joyfully offered by the family of Tahir Naveed (Chairman of Pakistan Minorities Alliance). It was a large gathering consisting of Orthodox faithful and those who wish to embrace holy Orthodoxy in the future. There was good number of women and children present. The law enforcement agencies increased security around the churches after the suicide blast in Peshawar on 22 September 2013, therefore the Christmas celebrations were held under tight security due to threats by Taliban. Christians in Pakistan are brave and come on the feasts in the church singing joyfully with complete faith in Lord Jesus Christ. Thank you very much for your passionate concern and spiritual unity with the Russian Orthodox Community in Pakistan.I am thankful from the core of heart for publishing this report on your website. I request all the readers to pray devotedly for ROC in Pakistan.